I think my link-finding algorithm has a few bugs. Anyway, I turned it into a link. Heheh, I've seen that guy before. 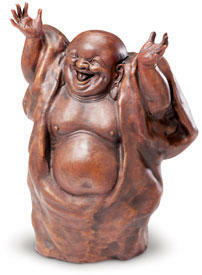 Probably not the best example of a laughing meditation, but he's funny in sort of a crazy way. I find deep diaphragmatic laughing as one of the most exhilarating and rewarding experiences. We are the only mammals, in fact any creature that can experience humor and laughter. I also believe there is evidence that the state that laughter creates triggers the release of healing chemicals and hormones throughout the body. Have you ever heard of the saying; "The chemical make up of tears of joy, and tears of sorrow is 99% different."